Spring is a time to reinvent, refresh and reflect on how we want to proceed through the warm months ahead. For most of us, after enduring the long winter, spring means spending as much time outside as possible. My own warm weather goals involve promises to myself to see the beach at least once a week no matter how busy life may get, spend less time on the couch, take more walks during lunch, ride my bike to work more frequently, and spend more time with friends and family. If you have similar goals, you can get started on them during the annual Green Commute Week taking place May 12-18. 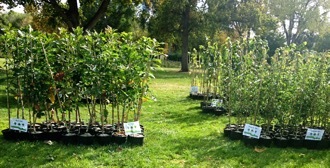 Green Commute is all about making transportation decisions that are good for our health and the health of our planet. And since everything is more fun with friends, teaming up is encouraged! What counts as Green Commuting? Some examples include walking, biking, carpooling, riding the bus, telecommuting, or driving a fully electric car! 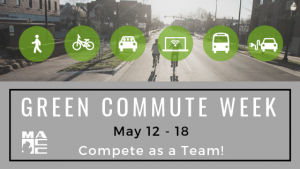 Here’s how it works: During the week, individuals and teams in the Holland/Zeeland area compete by choosing “green” transportation options when commuting to work, school, running errands, and so on. Miles are logged on the MACC’s website Monday through Friday. Those with the highest participation within their category will be declared the winner! This year, the winners will receive a trophy crafted by Cento Anni Custom Woodworking and an outdoor bike rack to keep or donate to a location of their choosing. This event is for everyone, whether you’re a year-round green commuter or first-timer interested in trying something new. 1. Register as an individual or form a team with your friends, family, co-workers, church, neighbors, club, sports team, classmates, or any other group of people you’d like to compete with. Register at www.the-macc.org. 2. Track your commutes and miles Monday through Friday on the MACC website. Total commute miles will be used to determine air quality benefits and may be used as a tie-breaker. 3. Visit the Recharging Stations! At those spots, Green Commute participants will receive discounts on things like food, coffee, bike tune-ups – and also get free rides on MAX Transit! 4. Share your progress with us and keep up to date with the week’s events on Facebook, Instagram, and Twitter at @GreenCommuteHZ. transportation projects planned for our area over the next four years. May 17: All Green Commute miles reports due to the MACC by noon. May 21: Green Commute Awards Banquet at Brew Merchant, 5:30 to 6:30 p.m.
 Carolyn Ulstad is transportation planner at the Macatawa Area Coordinating Council. 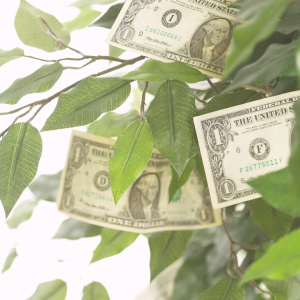 Two upcoming events provide opportunities for businesses and community members to learn about ways to support the “triple bottom line” – the business approach that accounts for social, environmental and economic impacts. 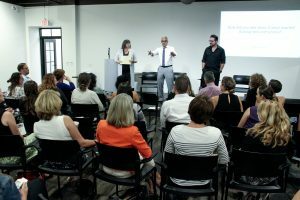 First, the West Coast Chamber of Commerce will host a kick-off event for a new Sustainability Affinity Group at their office at 8 a.m. Monday, April 22. 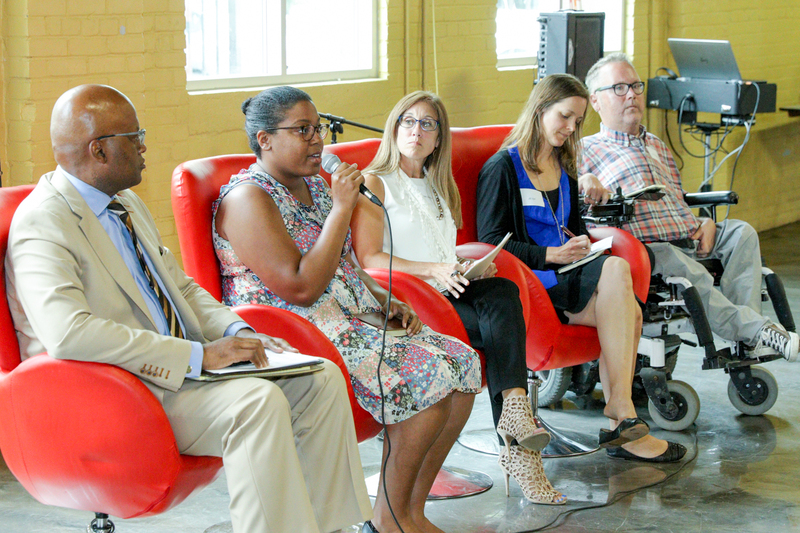 The goal of the event is to help businesses brainstorm about the role they can play in improving the social, economic and environmental well-being of our community. Registration information is available at the Chamber’s website at www.westcoastchamber.org. 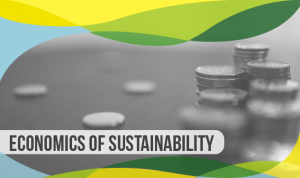 Second, the Living Sustainably Along the Lakeshore team will host an event on the “Economics of Sustainability” at 6:30 p.m. Tuesday, April 23 at Herrick District Library. 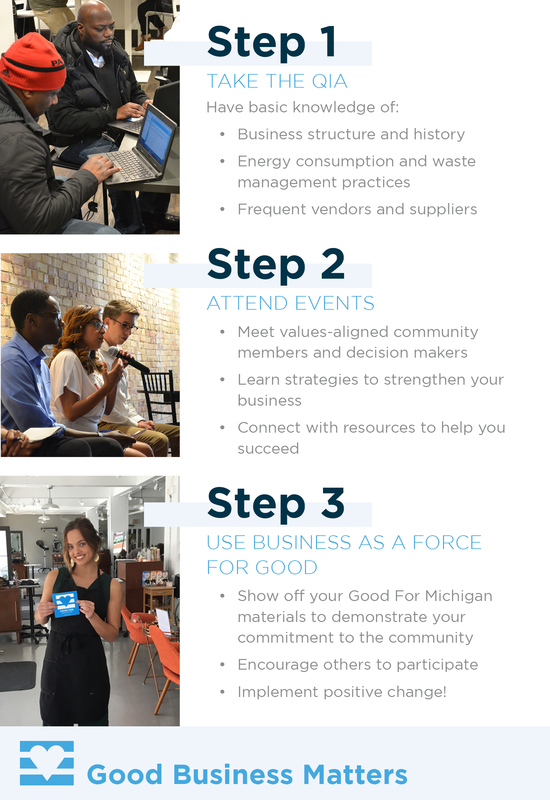 The Living Sustainably team is partnering with Good for Michigan to pull together a panel of experts who will discuss why and how they have implemented environmentally and socially responsible business practices, while ultimately prioritizing the growth of their bottom line. Community members and business owners alike will have time to ask questions. 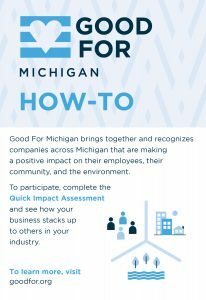 We will hear from representatives of: Local First West Michigan/Good for Michigan; the chair of the new Chamber Sustainability Affinity Group; Lakeshore Advantage; and local businesses like EcoBuns Baby + Co., Lemonjellos Coffee, and Goodwill Industries of West Michigan. impacts and foster a shared, durable prosperity for all.  Lakeshore Advantage’s SURGE program offers resources for early startups to achieve their next growth milestone.  Ecobuns Baby + Co. is a Holland-based business that is focused on being conscious of the overall environmental impact of the products they carry. The business provides a space for both education and a retail store that only carries products that families can feel good about using. 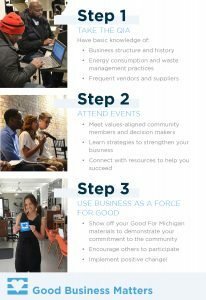  Goodwill Industries of West Michigan is an example of how one organization can help other business be more sustainable and create a network of participants. 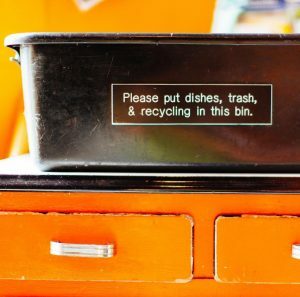 Their program for recycling, under the direction of Dan Broersma, has opened an avenue to reduce the amount of material entering landfills. Earth Day, April 22, is right around the corner and the Holland area is offering lots of great opportunities to learn more about the earth and ways to help protect it. 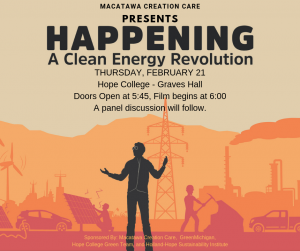 Check out the community calendar by clicking on the “events” tab at hope.edu/sustainability-institute to see all of the upcoming events. 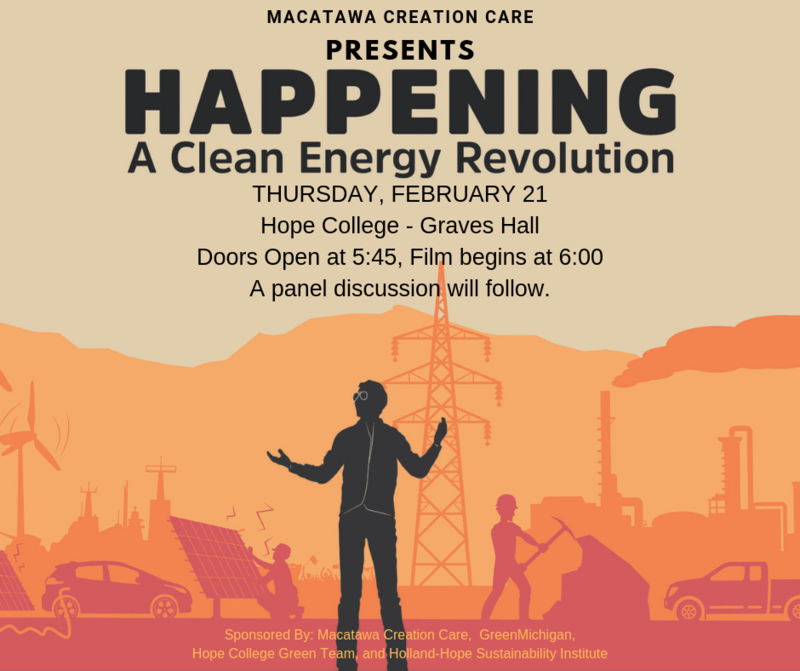  Michelle Gibbs is the director for the Hope College Office of Sustainability and the Holland-Hope College Sustainability Institute (HHCSI). Paul Lilly is a long-time advocate for sustainability in the greater Holland community and sits on the Steering Committee for the HHCSI. In Holland, we believe that in order to become a vibrant, world-class community we must look at all aspects of our community. This includes the “Triple Bottom Line” and the economic, social, and environmental impacts we all have. Our City of Holland Sustainability Committee has created a seven-pillar framework with “lenses” to help us evaluate and make more sustainable choices. We have used this framework model as a way to identify the 2019 Hope College Sustainability Research Projects. This year’s research projects were designated with a “green ribbon” on their research poster at the annual Celebration of Undergraduate Research and Creative Performance. Original research by students on topics ranging from: exploring the effect of the Vietnam War on the Hope College campus to finding out about the value of trees in the City of Holland; from learning about environmental factors that influence the Macatawa watershed to discovering how project-based learning in STEM classrooms impacts local students’ attitudes toward school, were highlighted during the Celebration at Hope College on Friday, April 12, from 2:30 p.m. to 5 p.m. at the Richard and Helen DeVos Fieldhouse. The students and their projects represented all of the college’s academic divisions — the arts, humanities, social sciences, and natural and applied science. The research and performance celebration, first presented in 2001, is designed to spotlight the quality and importance of student-faculty collaborative research at Hope. Undergraduate research is a hallmark experience for many Hope students and has been a teaching model used at the college for more than seven decades. Mentored collaborative research happens year-round, with approximately 300 students conducting faculty-supervised independent research during the academic year and 200 doing research over the summer, making Hope’s summer research program among the largest in the nation at a liberal arts college. Since faculty are active in scholarship year-round, many more students engage in research during the academic year. Research has a long and storied history at Hope College. More than 100 years ago, biologist Dr. Samuel O. Mast designed research laboratory space for the college’s Van Raalte Hall, which opened in 1903. The late Dr. Gerrit Van Zyl, who taught chemistry at the college from 1923 to 1964, is widely recognized for developing research-based learning at Hope in its modern sense. Hope has received recognition in a variety of ways through the years for its success in teaching through collaborative faculty-student research, and for the high quality of the research itself. For the past 16 years, since the category debuted, the “Best Colleges” guide published by U.S. News and World Report has included Hope on its listing of institutions that are exceptional for their emphasis on undergraduate research and creative projects. Hope is one of only 42 institutions of all types, and one of only 12 national liberal arts colleges, on the list in the 2019 edition. There’s no need to tiptoe to the tulips this year – or walk or drive downtown, for that matter. 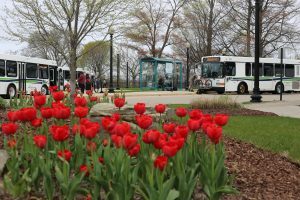 For a one-time fee for the whole festival, Max Transit will again provide easy Tulip Time access to downtown from outlying parking lots. 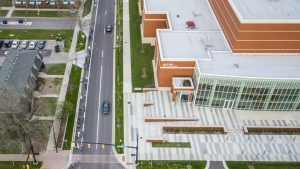 The Macatawa Area Express (MAX) is again pairing with Tulip Time to offer an inexpensive way to avoid parking and traffic problems during the festival that begins May 4. To avoid traffic and congestion, local residents and visitors alike are encouraged to leave their vehicles in MAX’s designated Park & Ride lots and hop on the shuttle into downtown Holland. This year’s Park & Ride lots will be located at D&W off of Douglas Avenue, Dutch Village on the corner of James and U.S. 31, and at Ditto, near the corner of Clover and Eighth Street. 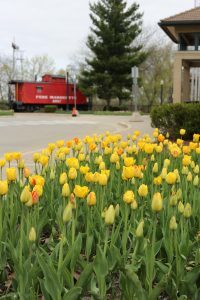 No need to tiptoe through the tulips to get to Tulip Time. Max Transit will again provide easy access from outlying parking lots. The shuttle’s main transfer point in downtown Holland will be at Windmill Island, with other stops downtown at City Flats Hotel (Seventh Street and College Avenue) and the Holland Rescue Mission Men’s Mission (Seventh Street and South River Avenue). 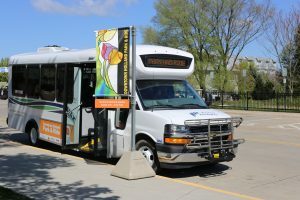 In keeping with this year’s Tulip Time theme of “Paint the Town Orange,” the shuttles will be identified by orange window clings to show pride in 90 years of celebrating this traditional festival. The Park & Ride shuttle will arrive at stops every 15 to 20 minutes to make pick-ups and drop-offs. The shuttle runs 10 a.m. to 6 p.m. every day during Tulip Time. The last shuttle of the day will arrive at each stop between 5 p.m. and 6 p.m.
To take advantage of this sustainable and efficient travel option, festival-goers must purchase a $5 wristband. The wristband gives riders unlimited rides for the entire festival on the Park & Ride shuttle as well as on MAX’s fixed bus routes. Wristbands are non-transferrable and non-refundable. Riders can purchase wristbands online at tuliptime.com, catchamax.org, or during the festival week at Ditto, D&W, Nelis’ Dutch Village, the MAX Transit depot office, and the Tulip Time office. An additional sustainable transportation option for festival goers is the opportunity to ride a bike part way and use the MAX bus to complete a trip. All of MAX fixed route buses can accommodate three bikes on a bike rack; the spaces are first-come, first-served. Using a personal bike, riders will be able to reach locations that fixed routes may not meet. MAX’s fixed route buses operate 6 a.m. to 7 p.m. on weekdays, and 8 a.m. to 7 p.m. on Saturdays. The fixed bus routes do not operate on Sundays, although the Park & Ride Shuttle will. www.tuliptime.com/transportation or call MAX Customer Service at (616) 355-1010.  As Shelby Pedersen grew up in Holland, she and her sister would ride the MAX bus all over Holland. Two years ago, aware of the importance of public transportation, Shelby joined MAX Transit as an information specialist. She is now marketing and customer service managers assistant. 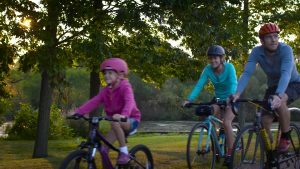 Below is a listing of some of the fun things happening around the greater Holland area that you can participate in to learn more about our Earth and how to protect it. 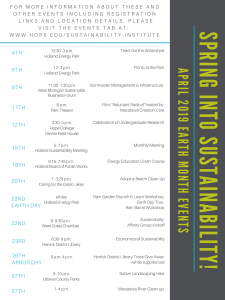 Be sure to also check out the events on the calendars for the Holland-Hope College Sustainability Institute, Outdoor Discovery Center, DeGraaf Nature Center, City Parks, and our county parks (Ottawa and Allegan). One of Ottawa County’s most alluring features is its water. For as far as the eye can see, Lake Michigan’s crystal-blue waters lap up against our expansive sandy shoreline. Twenty-four miles of coastline provide the perfect backdrop for walking, swimming, kayaking, boating, and fishing. 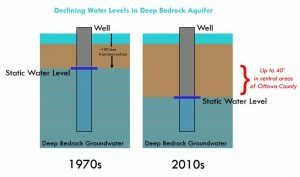 Water levels in Ottawa County’s deep aquifer, supplying wells for one in four county homes, have declined 40 feet in the last 40 years and are projected to drop another 20 feet by the year 2035. Residents get their drinking water in one of two ways – from municipal pipeline systems that pump water from Lake Michigan, or from private wells that pump water from the underground aquifers. Of the more than 104,000 households in Ottawa County, one in every four homes uses groundwater as their primary source of drinking water. 1. 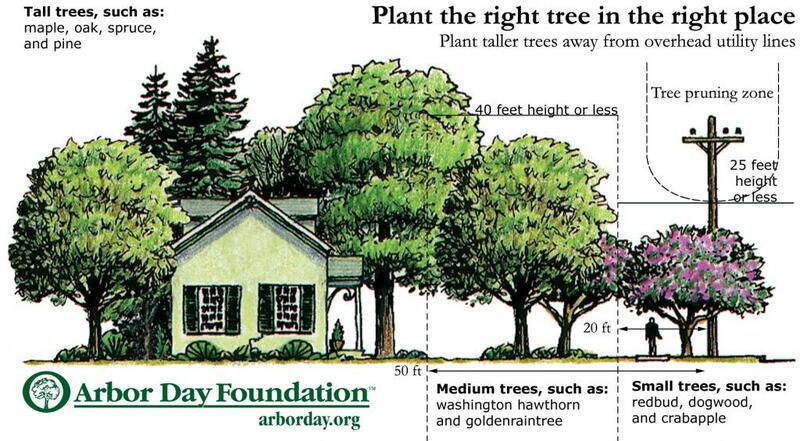 Practice smart lawn care: Ask yourself, how important is having a green lawn? 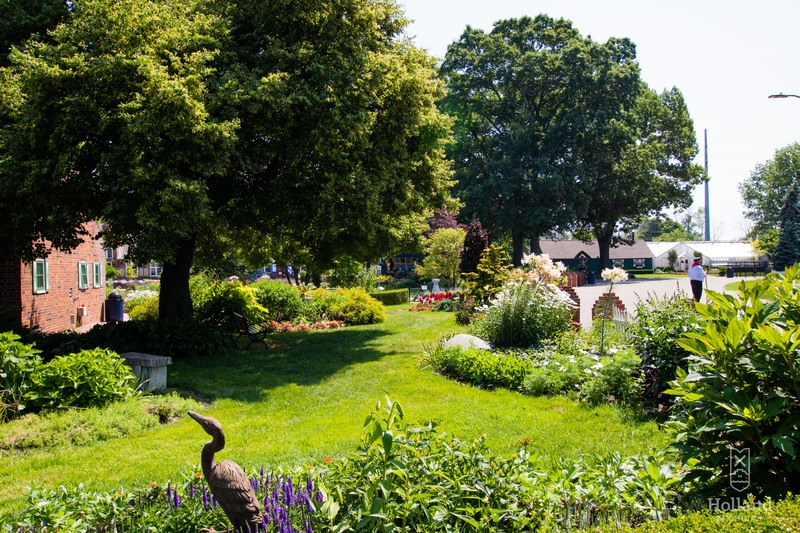 Homeowners use over 2 billion gallons of water annually in Ottawa County watering their lawns. 2. Load up washers: Start your dishwasher or washing machine when full. 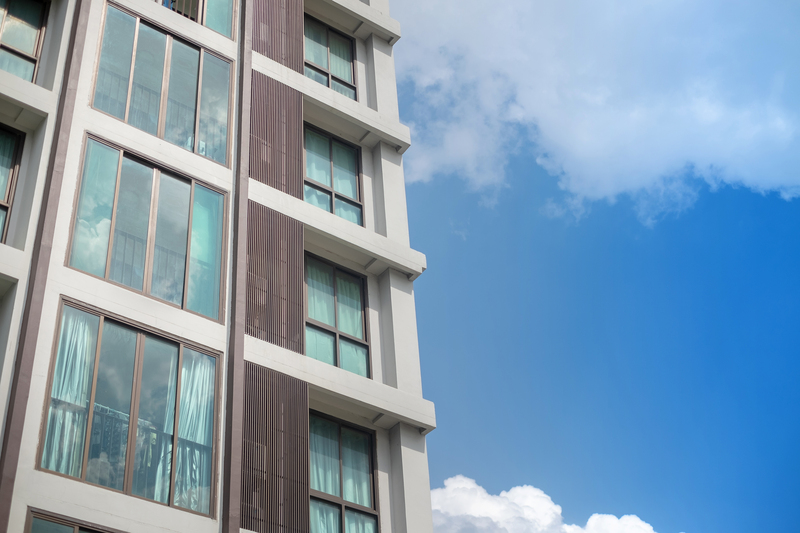 Older units use up to 16 gallons of water per cycle. 3. Turn off the faucet: Turn off the faucet when brushing your teeth. Faucets use more than two gallons of water per minute. 4. Low-flow devices: If you don’t already have low-flow toilets or faucets, install them to save water, and money. www.miottawa.org/groundwater. Also, this past week, March 10-16, was also National Groundwater Awareness Week. Learn more here: www.ngwa.org.  Paul Sachs is director of planning and performance improvement for Ottawa County, where he is responsible for implementing innovative, pragmatic solutions that positively impact quality of life and economic growth in the county. The Holland area suffers from a significant lack of housing that full-time workers in this area can afford. “Affordable housing is not a simple subject” might be the understatement of the year. Regular consumers of local news have undoubtedly noticed this topic repeatedly featured in recent city discussions. Housing issues affect everyone, though in different ways. 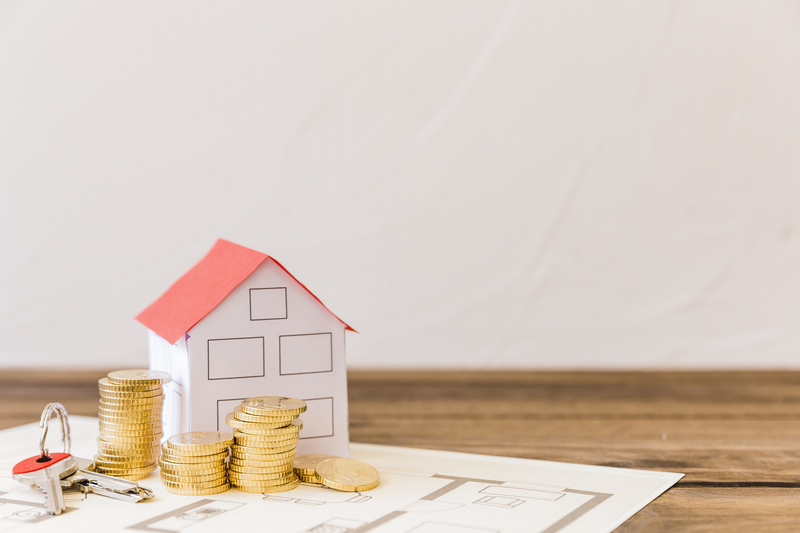 Even the casually interested likely have heard friends or coworkers mention how difficult it is to find a place to live or how stressed out they are when faced with an upcoming move, wondering if they will be able to find a situation they can afford. 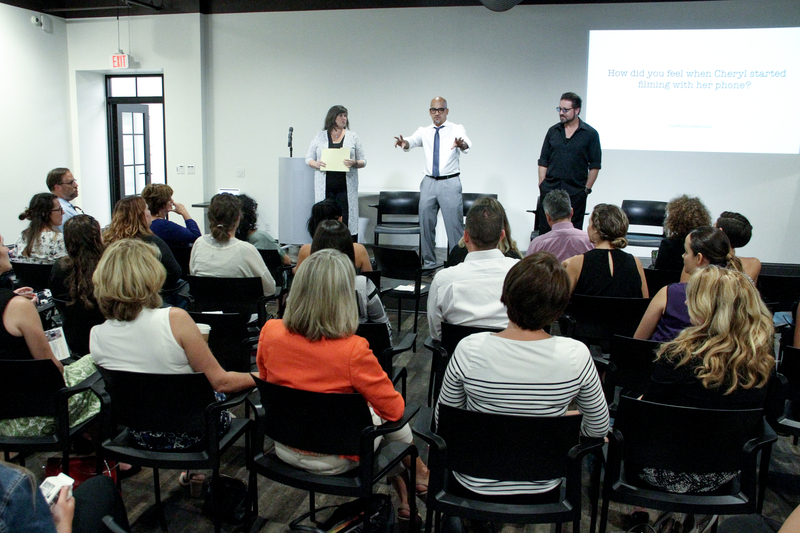 The next Living Sustainably Along the Lakeshore program will address how housing issues affect us and our neighbors. Four local housing experts will talk about what affordable does and could look like in Ottawa County at “Quality of Life: The Affordable Community,” to be held 6:30 p.m. Tuesday, March 5, at Herrick District Library, 300 S. River Ave.
All kinds of people are significantly affected by the lack of available housing at their price point. Housing Next’s May 2017 Impact Report, the most recent available, points out the large number in our community who fall in the ALICE category – ALICE, or Asset-Limited, Income-Constrained, Employed. That threshold is $56,400 for a family of four. The lack of housing that can be afforded by area workers is a major issue in Holland. Housing Next is a local initiative seeking to support all income levels needing affordable housing. Housing Next’s impact report recounts stories of seniors, recent graduates, factory workers, single mothers, and disabled adults struggling to make ends meet. In one example, Sue and Tom both make $10 an hour working at a factory. They like the area and want to stay, but their monthly income barely meets their expenses. Sometimes it comes down to a choice of what bill gets paid that month – rent or car insurance, day care or food. In another example, Tamara has a full-time job. As a single mother making minimum wage, she was forced to look for more affordable housing when her work hours became erratic. However, she couldn’t find anything near work and had to rent an apartment half an hour away, despite being concerned about her car’s reliability. She must now spend much of her budget on transportation. Housing and homelessness aren’t simply issues of poverty. Jobs paying low wages may not have been intended for individuals supporting families, but that situation has become the new reality. How do you manage to live a life of quality when your paycheck barely covers the roof your head? But building affordable housing doesn’t come cheap.  Hannah Gingrich is a public services assistant at Herrick District Library, a Living Sustainably Along the Lakeshore partner. Where: Herrick District Library, 300 S. River Ave.